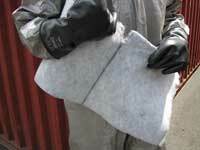 First responders, the military, hospitals and hazmat teams use Fibertect, a three-layer, flexible, inert, non-woven, non-particulate decontamination system. First responders, the military, hospitals and hazmat teams use Fibertect, a three-layer, flexible, inert, non-woven, non-particulate decontamination system. The product works effectively in the bulk decontamination of chemical warfare agents, toxic industrial chemicals and petroleum. The product is made from raw cotton and carbon, and is biodegradable. The decontamination system is made from three layers of material, consisting of a top and bottom fabric with a center layer of fibrous activated carbon that is needle-punched into a composite fabric. The center layer holds volatile compounds. Raw cotton can absorb up to 20 times its weight, but when chemically modified, the material holds two to three times that amount, according to the company. First Line Technology, Chantilly, Va.